One internally mounted M-61A1 20mm 20-mm, six-barrel cannon with 940 rounds of ammunition; four AIM-9L/M Sidewinder and four AIM-7F/M Sparrow air-to-air missiles, or eight AIM-120 AMRAAMs, carried externally. The F-15 Eagle has a perfect combat record of 101 victories and zero defeats. During the Balkan conflict, the F-15E was the only fighter able to attack ground targets around the clock, in all weather conditions. The F-15's superior maneuverability and acceleration are achieved through high engine thrust-to-weight ratio and low wing loading. Low wing-loading (the ratio of aircraft weight to its wing area) is a vital factor in maneuverability and, combined with the high thrust-to-weight ratio, enables the aircraft to turn tightly without losing airspeed. A multimission avionics system sets the F-15 apart from other fighter aircraft. It includes a head-up display, advanced radar, inertial navigation system, flight instruments, ultrahigh frequency communications, tactical navigation system and instrument landing system. It also has an internally mounted, tactical electronic-warfare system, "identification friend or foe" system, electronic countermeasures set and a central digital computer. The head-up display projects on the windscreen all essential flight information gathered by the integrated avionics system. This display, visible in any light condition, provides the pilot information necessary to track and destroy an enemy aircraft without having to look down at cockpit instruments. Low-drag, conformal fuel tanks were especially developed for the F-15C and D models. Conformal fuel tanks can be attached to the sides of the engine air intake trunks under each wing and are designed to the same load factors and airspeed limits as the basic aircraft. Each conformal fuel tank contains about 114 cubic feet of usable space. These tanks reduce the need for in-flight refueling on global missions and increase time in the combat area. All external stations for munitions remain available with the tanks in use. AIM-7F/M Sparrow missiles, moreover, can be attached to the corners of the conformal fuel tanks. The F-15 Eagle is one of the most capable multirole fighters in the world. The F-15 entered service in 1974 and has attained an unprecedented perfect air combat record of 100.5 victories and zero losses. 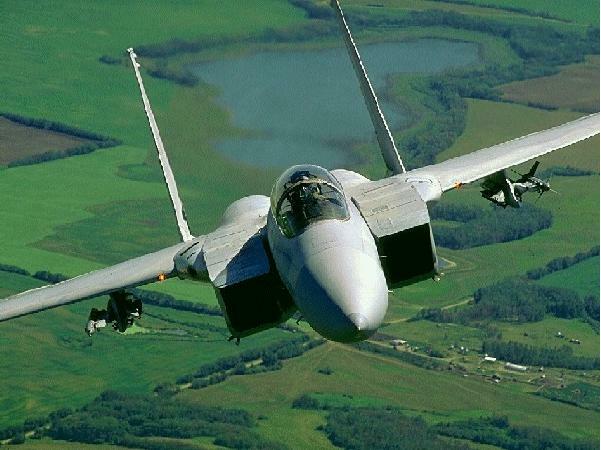 F-15s were responsible for downing 33 of the 35 fixed-wing aircraft Iraq lost in air combat during Operation Desert Storm, and the F-15 was responsible for downing four Mig-29 fighters during the Balkan conflict. In Desert Storm, the F-15E strike fighter provided devastatingly effective flying at night and in bad weather to attack numerous mobile Scud missile launchers and other high-value military and ground targets. The F-15E also maintained a 95.5 percent average mission capable rate, the highest of any fighter in the war. In the Balkans, the F-15E was the only fighter able to attack ground targets around the clock, in all weather conditions. The F-15E can carry payloads of up to 23,000 pounds and is the only fighter in U.S. production capable of performing the long-range, precision strike mission. More than 1,500 F-15s have been produced for both domestic and international customers, and have accumulated more than 4.4 million flight hours. Approximately 1,150 F-15s are still in service worldwide with the U.S. Air Force and Air National Guard, and with the air forces of Israel, Japan and Saudi Arabia.